Metal roofs are experiencing a renaissance in Michigan. Though the initial investment in a metal roof is considerable, metal roofs are a wise investment because they are completely fireproof, have a lifespan of roughly 30-50 years, and are 100% recyclable. Additionally, metal roof shingles are quite attractive, matching the visual appeal of cedar shake, copper, asphalt or slate. If you are interested in a metal roof, call the experts at A.H. Construction & Roofing Company to handle your metal roof installation. We can also help to repair or restore your current metal roof if it has become damaged or compromised by bad weather. No matter the size of your metal roof project, we are excited to work with you. Whether you need a new metal roof, a re-roof, snow removal, or ventilation installed, A.H. Construction & Roofing Company is the company you can trust to get the project done–and done well. At A.H. Construction & Roofing Company, we pride ourselves on using only CertainTeed and GAF materials and finishing all projects in one day or less. Every one of our roof installers and contractors is fully-trained and fully-licensed, so you never have to worry that your project will be rushed or done incorrectly. Best of all, our owner is on-site at every project, making sure our team stays on-budget and on-task. We know there are a lot of companies to choose from in Ypsilanti and Southeast Michigan when it comes to your roofing needs. Call us today at 734-481-1983 so we can show you first-hand what sets us apart from the competition, starting with our free, no-obligation comprehensive roof inspection. Call (734) 481-1983 for a free estimate or contact us by filling out our contact form. 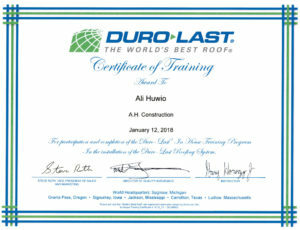 Ali replaced our roof several years ago and did a wonderful job. We have relied on him since for a variety of additional work, including bracing the roof from inside the attic, the installation of an attic fan and roof vents, the replacement of the roof on our porch, and the removal of an old chimney.